If you have been following my posts, you know that one thing I try to do when putting together activities for My Obstacle Courses is use things I already have, whether they are toys, pouches or calendar cutouts. I love it when I look around the house and find something that can help me make developmental and academic skill building fun by using it in a different way. One Christmas, years ago, we received one of those game sets with dice, cards, dominos, chess pieces and wooden circles to be used as checkers all stored inside a wooden box. I was trying to reduce the amount of stuff and clutter that had accumulated and found this game set just sitting in a cupboard. While we had packed and moved it a few times, we never really used the game set for it’s original purpose. Now that I was thinking with a different mindset, trying to use things around the house to help Andrew, I was glad we still had it because of all the possibilities for the pieces inside. The box (which was broken) went, the pieces stayed! 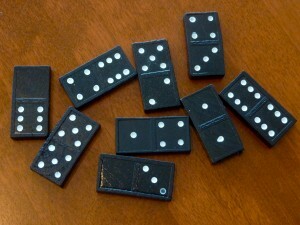 Lining dominos up requires steady hands and strong fine motor skills. or match up sides that have the same. Matching up sides that have the same amount. 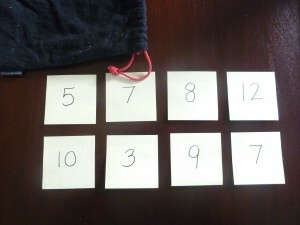 Sides with same amounts matched up (4's, 3's, and 6's). 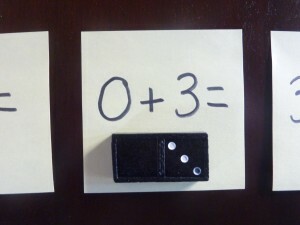 While these are both great activities for fine motor skill building (having to place them so they line up) and the latter is good for number awareness, there are other ways to use them at home, specifically to build and reinforce math skills. I do My Obstacle Courses with Andrew so I can have fun and really engage with him. 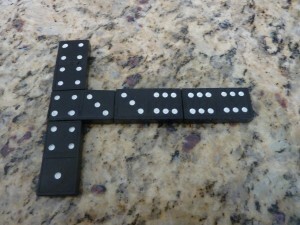 Having some unexpected tools like dominos helps to keep things interesting and since there are usually 28 in a box or package, it allows for a good deal of randomness. 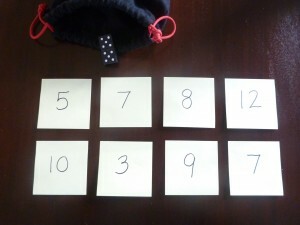 When I place some in a pouch and he has to reach in and take one out, neither of us know what it’s going to be and that alone turns it into a bit of a game – more fun than flash cards in my opinion! Once you have your dominos, preparing these station activities is a piece of cake! 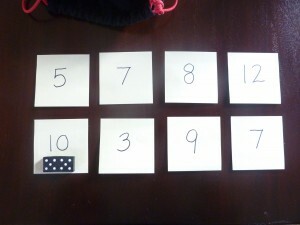 I wrote out the total number of dots from each domino on a Post-It Note and arranged them at the station in random order. You could put them in number order as well, I just wanted him to be really looking at the number on the paper. Note: Instead of writing the numbers or facts for them, you could provide a white board or chalk board and have them write the numbers or facts as they pull them out to build writing skills. I placed them in the black pouch (adds some mystery!). 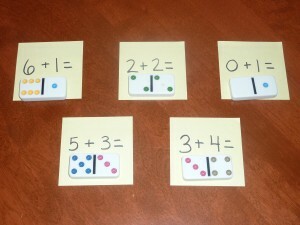 My Obstacle Course station activity: Matching dominos with the total number of dots. 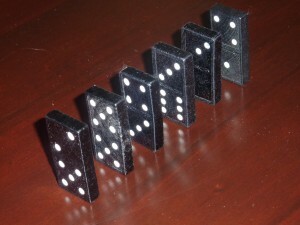 Reach in a get a domino. Count the total number of dots ("How many dots in all?"). 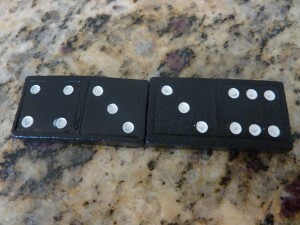 The first domino matched with correct number. More dominos matched with their total number of dots. 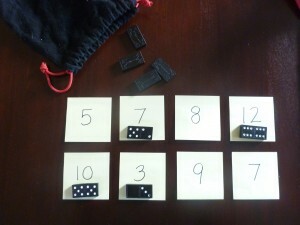 All of the dominos from the pouch matched with their numbers. 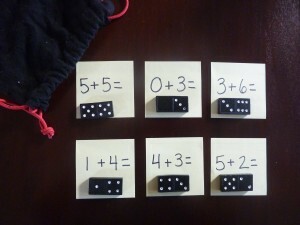 My Obstacle Course station activity: Matching dominos with addition equations. 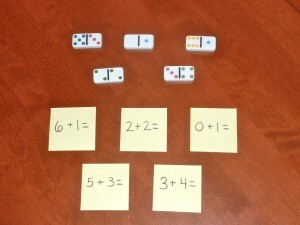 Addition equation and domino matched up. Dominos matched up with their addition equations. Same activity using the colored dominos. 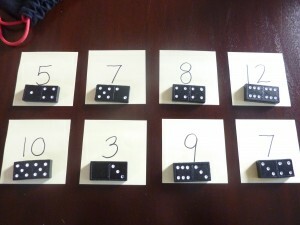 My Obstacle Course station activity: Match up dominos with addition equations. 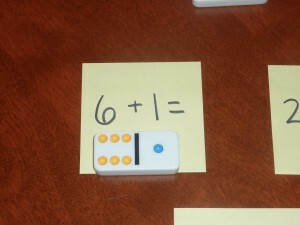 A colored domino matched up with its addition equation. Colored dominos matched up with their addition equations. I love how easy (and inexpensive!) 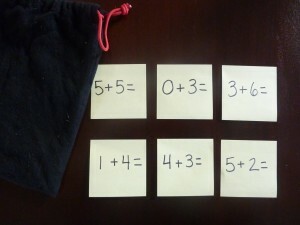 these activities are to set up and how by adding a little bit of mystery and randomness, they become a fun way to build math skills.